Tony's thoughts: The good news is the Lady Porters are deep and return all seven starters from a year ago. They had an 8th runner who subbed at sectionals and ran 18:48. Josephine Bober should be among the team's top runners if you take in account that she bossed the track ledger 3200m and advance to Charleston. Hopefully, she or someone can be a top low-stick that accompanies last year's top scoring split. As we all know it means nothing if you can't run in the company of the top teams. 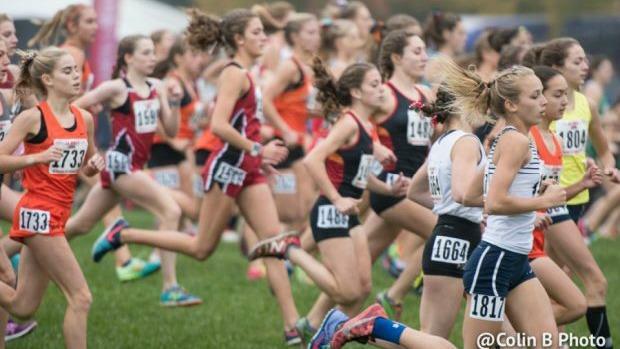 Coach's thoughts on the team: 2017 was a very big year for OE girls cross country. We finally broke through and qualified for the state meet as a team for the first time in school history. We graduated a very talented class who displayed tremendous leadership over the past four years. We will look to Morgan, Kara, Katherine, and Elyssa to continue their great leadership and work with our new team members to build upon what the 2017 team accomplished. We have a very talented and hard-working freshman class this year that will be ready to step up and fill in the gaps after the strong summer of training they have had. We are very excited to get the season going and continue building the Oswego East distance running program. Coach's thoughts on the team: We had our best finish in the 3-mile era last year. We didn't have our best race at state and hope to move up. We are returning our top 3 and hope that the experience at state last year will motivate the group and help them understand that everyone makes a difference in the top 7, not just the top runner. Projected top 7: Too early to predict. Any of the names mentioned here plus a few others will compete for these spots throughout the season. Coach's thoughts on the team: Summer training has gone well with no injuries up to this point. Two of our top seven from last year have graduated (Roxanne Temple and Samantha Kaye). Danielle missed most of last Cross Country season and was not 100% when she returned for the State Series. Danielle is healthy once again and has had an excellent summer of training so far. Eva really stepped up as our #1 runner while Danielle was out last year and expect her to take another step forward this season. Eliza and Jana both add valuable experience and look to improve upon their performances from last season. Aly comes in with a very proven middle school resume finishing 2nd in Class 3A in Cross Country (11:05 for 2 miles) and 2nd in Class AA in track & field in the 1600m (5:02.08) as an 8th grader. Aly will definitely be a welcome addition to our team and someone to watch out for this year. If we are able to stay healthy, there is a good chance to have a successful end to the season. Projected top 7: To early to tell. The dual meet against Glenbard West on August 28th with determine our first top 7 line up of the season! Newcomers: Due to many of the freshman taking summer school it is very early to tell. We have a lot of young talent on the team with the potential to make a difference this year and years to come. Coach's thoughts on the team: This team is lead by many veteran runners who are determined to place better within the WSC Silver Division along with finishing at the state meet near the top 10. Many of the girls on the team have had a strong summer training with increased miles, hills and tempo runs. Coache's thoughts: This is the largest incoming freshmen xc crew we have ever had- Hussain and Walczak finished in our top ten at Detweiller at Dark. Ballard is new to cross country but had run distance for track. In addition, the girls are hoping to qualify for the state finals again this fall. We are returning Juliana Stogsdill, as well as several of the ladies from the 2017 squad. Half our team consists of freshmen, so we are hoping for big things from those ladies. Newcomers: Hard question to answer as we are not entirely sure the freshmen class we will end up with. Although, we are very lucky and will be having a sophomore joining our ranks this season who is an outstanding athlete, Emily Stine. She originally chose to do swimming and has now directed her attention towards running. Coach's thoughts on the team: We graduated a few key top runners last year who were not only talented but leaders for our team. Luckily, we have athletes who are ready to work hard and fill those shoes. In terms of experience, we will be a relatively young team. We also as a program are going through a rebuilding phase focusing on commitment, goal setting, and culture. Those are our focus points for this year and within that journey, our team will flourish even if it takes a few seasons to do so. Coach's thoughts on the team: A lot of key seniors graduated from the Saxon 2017 roster. It will be difficult to replace Madison Marasco, but the team is looking to work together to make a name for themselves. This group of ladies work well as a pack but are not afraid to step it up when they are needed. Mikeelie Jensen and Ashlee Jenks run well together to lead the Saxons. The top 7 will be changing throughout the season because there are many strong team members vying for the spots. Our season goal is to qualify for the state meet. Coaches thoughts on the team: We are coming off a season where we did make the state meet but finished at the bottom. 3 of our top 7 graduated, including 1 all-stater (Olivia Niziolek). Niziolek helped us by running up front in most meets, and she will be hard to replace, so we will be looking to run as a tight pack. Hopefully, our leadership from May and Bomrad will be sufficient as we attempt to get the pack as far to the front as possible. It is too early to know for sure, but after a solid summer of running, we might have several new faces to add to our pack, including an incoming freshman listed above (Marcucci) who impressed in the summer. Coach's thoughts on the team: Nine Seniors with lots of track success. Time to translate that mentality to the XC course. We will do all we can to battle the 3a juggernauts - as we always have - despite the many systematic challenges we face. Coach's thoughts on the team: After a disappointing 8 th place finish at Sectionals last season, this team's commitment to getting back to the state meet was more than apparent in their summer training. After a slow start in June due to getting over few track injuries, this team looks great heading into August! I can't wait to see what October will hold for them! Projected top 7: It is hard to project. It could include any of the above and possibly a few others. Newcomers: We do not have any newcomers to the program besides our freshmen. It is too early to say whether or not any of our freshmen will contribute in their first year. Coach's thoughts on the team: We are excited about the upcoming season and hope to improve upon our State Final finish from last year. We have a solid core group who is coming off of a really good track season. I am hoping that the significant improvements individuals made during the track season will translate well to cross country.